For recording live music, band rehearsals, classes or interviews the Tascam DR-05 Linear PCM Recorder is an unbeatable value. 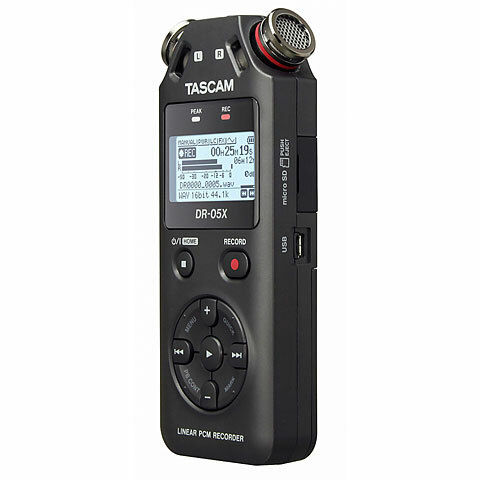 The Tascam DR-05 provides up to 24-bit 96 kHz stereo recording in an easy to use portable recorder in both MP3 and WAV format audio to microSD and microSDHC media. A pair of stereo microphones handles up to 125 dB SPL. The Tascam DR-05 Linear PCM Recorder is a compact handheld digital audio recorder that uses microSD and microSDHC media cards to recorder stereo linear 44.1/48/96 kHz 16/24-bit WAV files and compressed 32-320 kbps MP3 format audio files. On-board low noise omni-directional stereo microphones capabile of handling 125 dB SPL signals and a built-in 0.3-watt mono monitor speaker make recording easy. Two AA batteries power the Tascam DR-05 recorder for 17.5 hours, even while recording at CD quality, plus the Tascam DR-05 can be powered by USB bus power or optional AC adapter. The Tascam DR-05 records at over CD quality audio with a 92 dB signal to noise ratio, under 0.05% total harmonic distortion and 20 Hz to 20 kHz frequency response at 96 kHz 24-bit resolution. A chromatic Tuner and Varble Speed Audition playback function which allows the Tascam DR-05 Linear PCM Recorder to change the playback speed from 0.5 to 1.5 times the normal speed without changing the pitch make the DR-05 suitable for instrument practice. The Tascam DR-05 recorder provides a range of inputs and outputs with 1/8-inch input fac for an external stereo microphone or stereo line input and 1/8-inch line output / headphone output jack. Use the USB 2.0 Mini-B port to transfer MP3 and WAV audio files on the Tascam DR-05 recorder's microSD card to a Mac or PC computer or from a computer to the DR-05 recorder's microSD card. Other features of the Tascam DR-05 Linear PCM Recorder that make recording easy and fool-proof include a Quick button for access to various functions, a Peak reduction functionn to reduce the input automatically in case of excessive input levels, an Automatic Level Control to increase or decrease the recording volume when the input sound is too small or too large, a Limiter to automatically reduce the level when the input is too high, and a Low cut filter to reduce low frequency noise. There is even a Rec Delay function to avoid recording the sound of pressing the Record button. All visible on a 128 x 64 pixel backlite LCD screen. 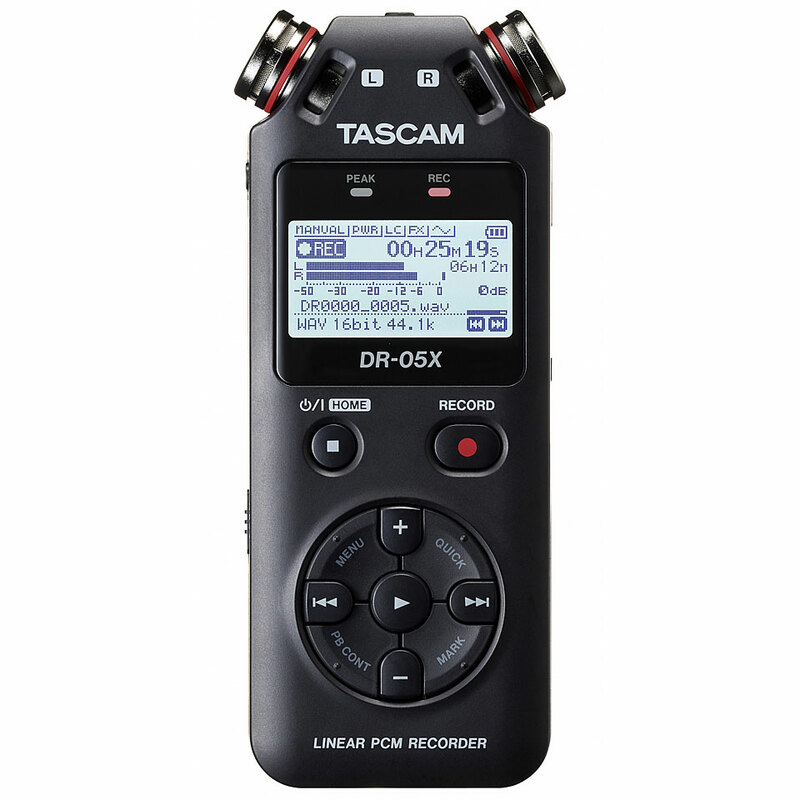 The Tascam DR-05 will record for a maximum 13 hours 28 minuits stereo 44.1 kHz 16-bit WAV audio to a 8 GB card and over 596 hours 32 kbps MP3 stereo/mono to a 8 GB card. 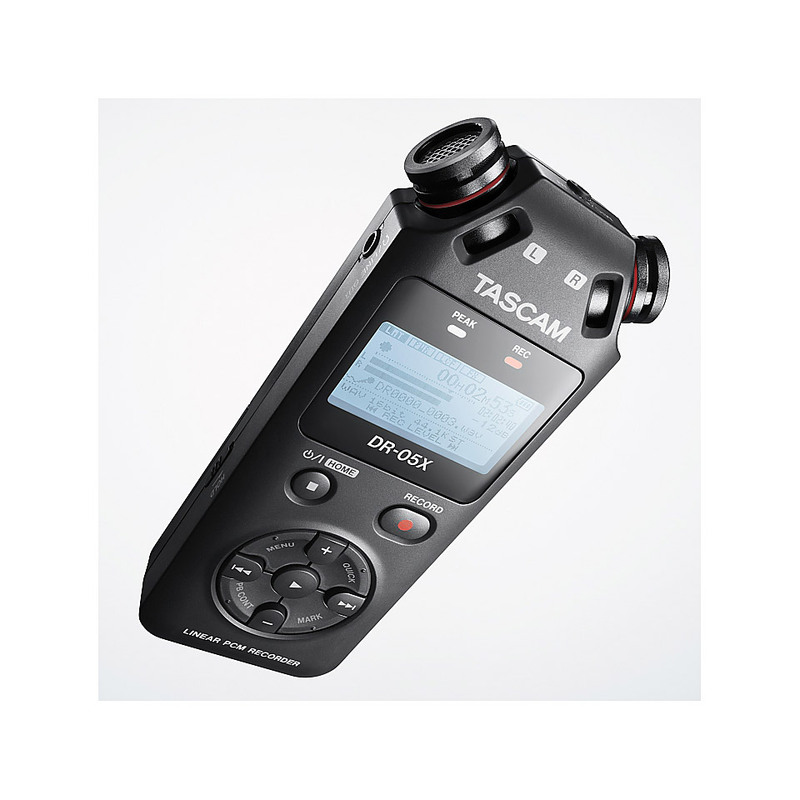 The Tascam DR-05 Linear PCM Recorder ships with an 2GB microSD card installed, two AA alkaline batteries, USB cable, warranty card and owners manual. This item was given an average rating of 4.6 out of 5 stars. No review about this product has been written yet. 28 ratings exist without a text or these reviews are written in another language.